If you’ve kept your thumb on technology news of late, you’ve probably heard plenty of stories involving the popular, yet often ambiguously referenced “cloud.” You may be wondering, what exactly is the “cloud,” and why is it a trend I should be following? At Pickuphost.com, we’re ready to help answer those questions and more. To start, the “cloud” simply refers to cloud computing, the latest form of a virtual private service hosting, which means that all of a subscriber’s data is hosted in a local entity spread over large interconnected servers using the internet. Specifically, cloud computing allows for the networking or sharing of resources among multiple users. Google Drive, for example, uses cloud computing. This latest expansion of virtual private service hosting is popping up everywhere on lists of technology trends for 2015. According to reviews like that from Virtualization Review, cloud computing technology is gaining prominence in essentially every aspect of the IT industry. While cloud computing may not be the perfect option for every business or individual depending on circumstance, it does present users a number of advantages, and it’s rapid growth and expansion indicate the likelihood for even more improvements in the near future. Intrigued? Read on to learn even more about what’s to love about cloud computing. For most companies, the idea of purchasing a large host server to be maintained in a physical location is less than appealing: owning a server is expensive and requires knowledge of proper maintenance and upkeep. There are a lot of alternative options to owning a host server that are cheaper (basically every other option), but a cloud computing VPS is probably one of the most cost-effective and convenient. Because cloud computing uses the internet to provide access to software, a company’s employees can do their job from anywhere in the world, which spells impressive gains in efficiency. And, not only can your employees work from any location, they can work on the same tasks simultaneously. Collaboration need not be sacrificed with cloud computing. Another benefit of cloud computing is that it offers users both flexibility and control. Unlike other types of hosting services, a cloud computing supplier puts the user at the helm, but still takes care of the time-consuming overhead work. Companies can install the specific software to the cloud that will work best for them, or replace old software whenever they choose (which isn’t the case with a shared host service). But if a company is interested in saving valuable time, their cloud computing supplier will conveniently install the routine software and security updates automatically. In addition, customers of the cloud can easily update their packages to increase the RAM memory and disc space available. Take Comfort in Enhanced Security. As cloud computing provides just one server for data storage, the security of the data is considered to be inherently more dependable. Each time a user navigates through a company’s web page, rather than accessing information stored from various servers, the data is readily available from a single host, which doesn’t bring with it as many risks as that of a physical server. If your company works with sensitive data or is just plain concerned with security in general, a cloud computing service is probably a smart way to go. And, if the cloud server ever experiences failure and one server is off, customers benefit from the cloud’s ability to quickly turn to service other servers to ensure that a customer’s site continues to run without disruption. There’s every indication that 2015 will witness even more development and improvement in cloud computing, with hosting tech companies aiming to enhance synchronization of content across a user’s multiple devices, as well as “application portability across devices” (Virtualization Review). And did you know? 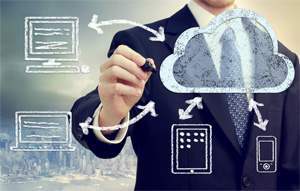 The CRN predicts that small businesses will spend over $100 billion dollars on cloud computing. We expect that companies will reap the benefit of investing in a growing, cutting-edge cloud computing system for their virtual private service hosting. The way we see it, why not invest in an exciting technology on the cusp of innovation? Interested in learning more about hosting services for your company or personal website?